The great majority of narrative paintings refer to well-known oral or text narratives, but a few do not. 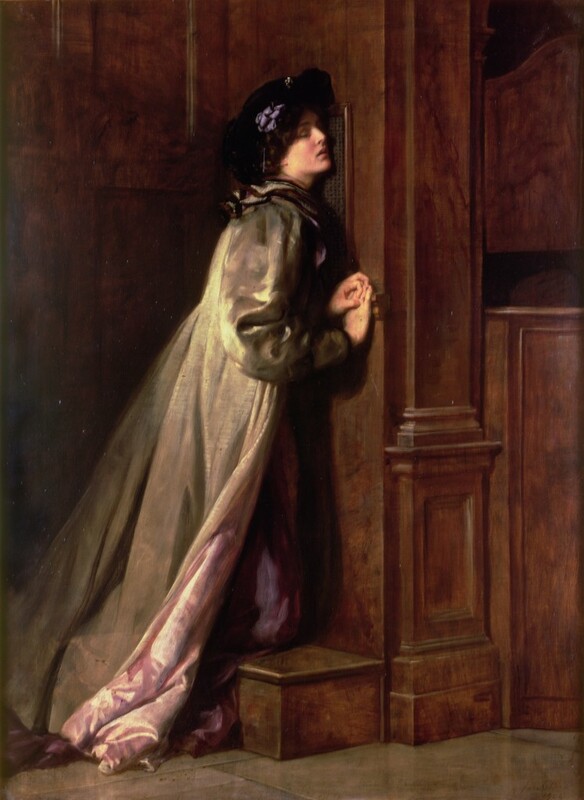 British painters of the late Victorian period not only made a speciality of painting narratives which were not known to the viewer, but created a sub-genre of problem pictures, whose whole purpose was to encourage speculation as to their narrative. 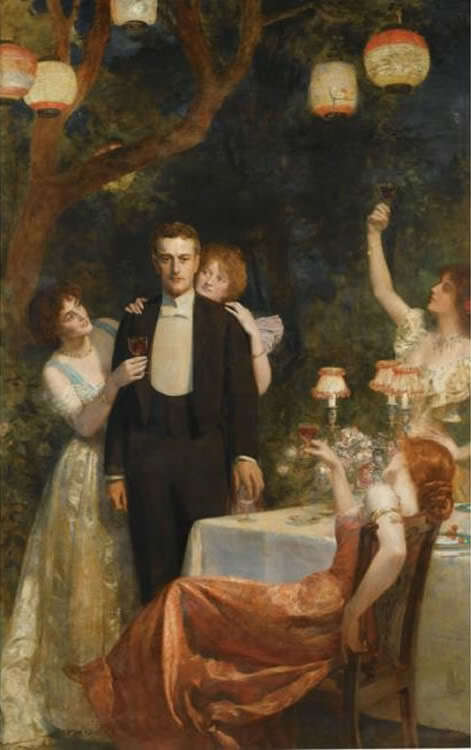 Precursors of these problem pictures started to appear around 1850, but they became most popular and problematic over the period 1895 to 1914, particularly those of John Collier. These became popular topics of discussion among the chattering classes, and their debate and possible narratives were even covered in the press of the day. 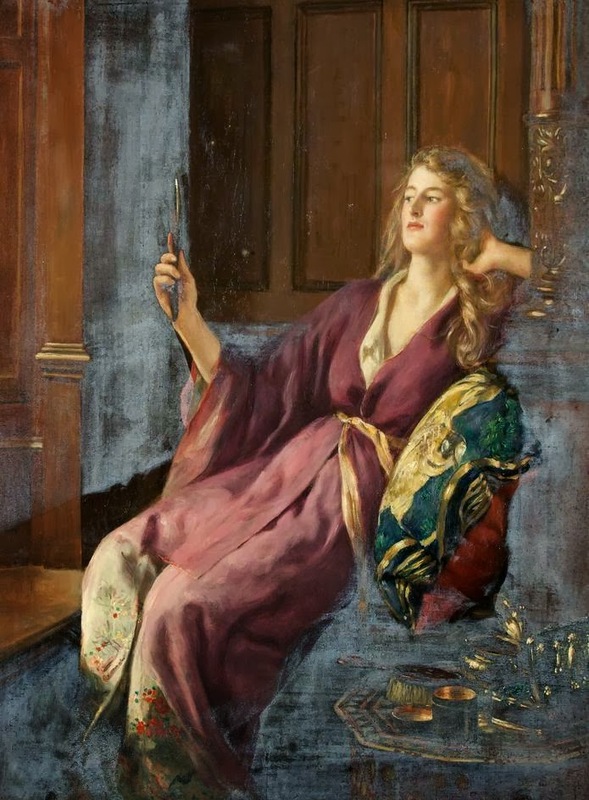 This article traces their origin, and provides a few examples by the master of problem pictures, John Collier – whose Sleeping Beauty I discussed earlier. William Holman Hunt (1827-1910), The Awakening Conscience (1851-53), oil on canvas, 76 x 56 cm, The Tate Gallery, London. Wikimedia Commons. 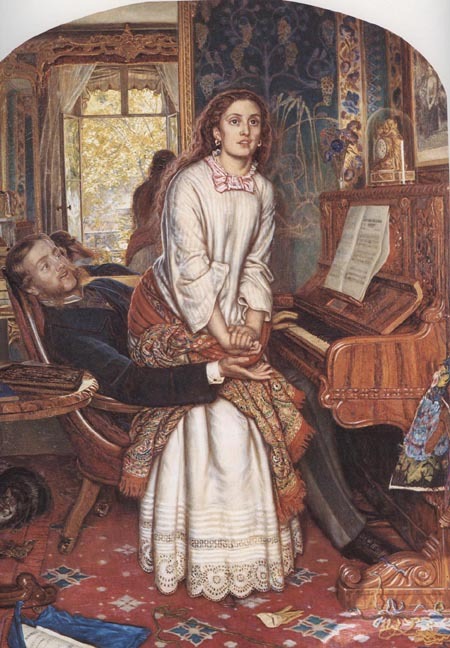 Probably the best-known precursor to the problem picture, and one of the earliest, Hunt’s The Awakening Conscience (1851-53) shows a domestic conflict. Originally, the woman’s face was even more anguished, but shock among critics encouraged Hunt to moderate her facial expression to that now seen. Careful examination of the painting reveals many cues to a more controversial narrative, of a ‘kept’ mistress and her lover in disagreement. There is no wedding ring on the fourth finger of her left hand, which is a focal point of the picture. The room itself is furnished gaudily and in poor taste, and contains evidence of the woman’s wasted hours waiting for her lover: the cat under the table (which symbolically is shown toying with a bird), the clock inside a glass on top of the piano, the unfinished tapestry, and so on. That said, what is the underlying narrative? Is this just the regret of the ‘kept’ mistress, and her desire for a more regular relationship and family? Additional details of this painting are on Wikipedia. Yeames’ And when did you last see your Father? is set in the English Civil War, as indicated by the Puritan dress of conical hats and plain clothes. This contrasts with the opulent silks of the mother and chidren, who are clearly Royalists. 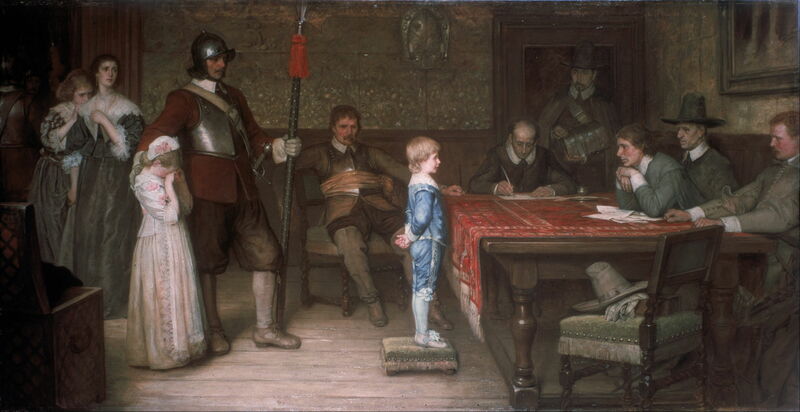 The young boy is being questioned, presumably as given in the title, for him to reveal the whereabouts of his Cavalier father – an act which is bringing great anguish to his sisters and mother. Setting most of the cues to the narrative in the dress and disposition of the participants makes it a greater problem, although here with sufficient interpretative information the problem is readily soluble. 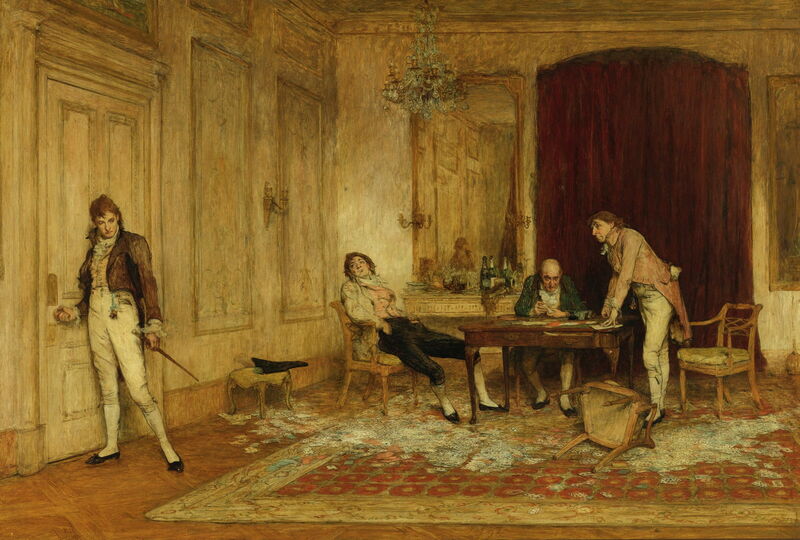 William Quiller Orchardson (1832-1910), Hard Hit (1879), oil on canvas, 84 x 122 cm, Private collection. Wikimedia Commons. Orchardson’s Hard Hit is more difficult to solve. The fashionably-dressed young man about to open the door on the left is walking away from a group of older villains, who have stopped at nothing (including perhaps cheating) to beat him repeatedly at cards, and have relieved him of his wealth. This is told well using classic Alberti techniques such as facial expressions, but most importantly here by body language and direction of gaze. Orchardson’s model provided the inspiration, when he arrived dejected at the studio one day and revealed that he had been ‘hard hit’ himself the previous night. 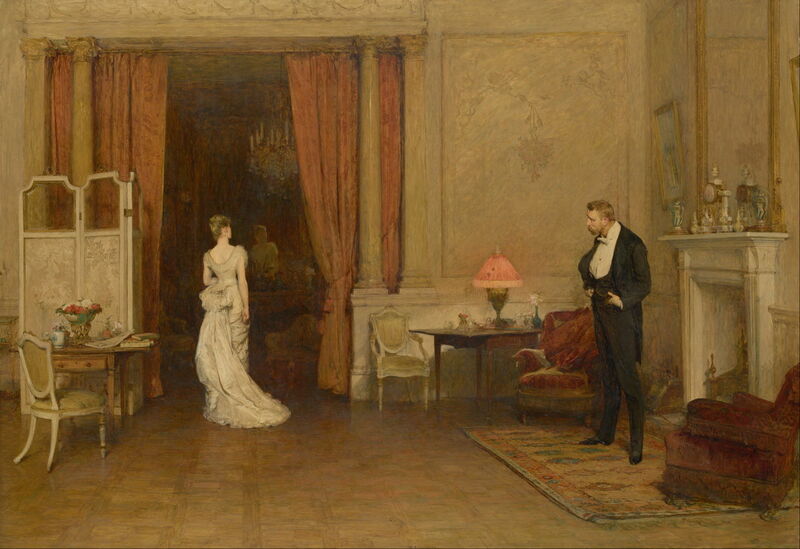 William Quiller Orchardson (1832-1910), The First Cloud (1887), oil on canvas, 134.8 x 193.7 cm, National Gallery of Victoria, Melbourne, Australia. Wikimedia Commons. That by-and-by will make the music mute. By the 1890s, Collier was looking for something beyond the portraits which had made him successful, and exploring different ways of making history painting more relevant to the social issues of life at that time. John Collier (1850–1934), The Garden of Armida (1899), oil on canvas, 262 x 178 cm, Private collection. WikiArt. The Garden of Armida (1899) was an early attempt to show a traditional historical subject, that of Rinaldo in Armida’s garden from Tasso’s Jerusalem Delivered (see this article) in a contemporary setting and dress. In doing so, he posed the problem as to whether the viewer was to see some more modern narrative beyond Tasso’s original. It was not well received, and Collier decided to try more direct problem pictures instead. The Prodigal Daughter (1903) was far more successful, and remains one of Collier’s best-known works. An elderly middle-class couple are seen in their parlour in the evening, surprised by the interruption of their prodigal daughter, who stands at the door. This immediately sparked debate over the role of women in the modern world, the nature and scope of their family responsibilities, and changing class boundaries. Collier went to great lengths to capture the expressed emotions, in terms of the daughter’s facial expression, and the contrasting body language. The daughter is seen as a ‘fallen woman’, thus part of a popular mythology of the time. But far from appearing fallen and repentant, she stands tall, proud, and wears a rich dress. The resulting discussion spilled over from art gossip columns into more general editorial and comment sections of the press. 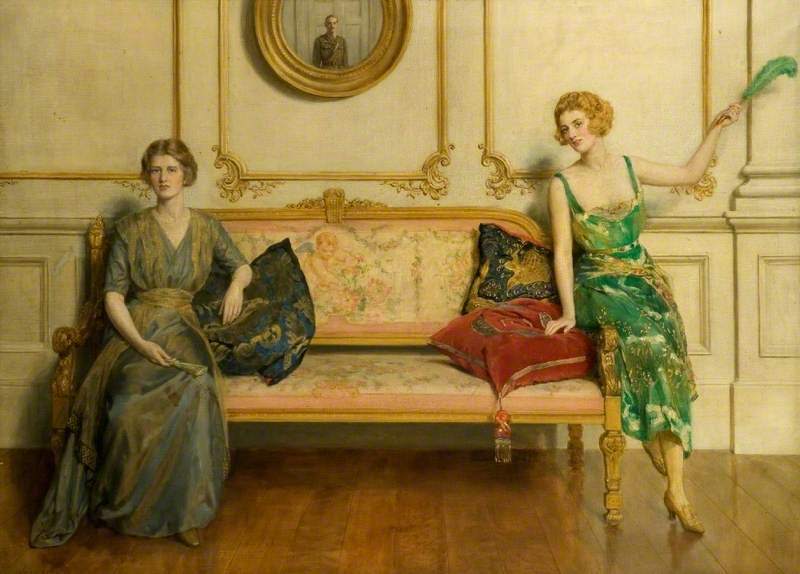 John Collier (1850–1934), Mariage de Convenance (1907), oil on canvas, 124 x 165 cm, Cyfarthfa Castle Museum & Art Gallery, Merthyr Tydfil, Wales. The Athenaeum. A few years later, his Mariage de Convenance (1907) was another painting which received extensive media coverage. 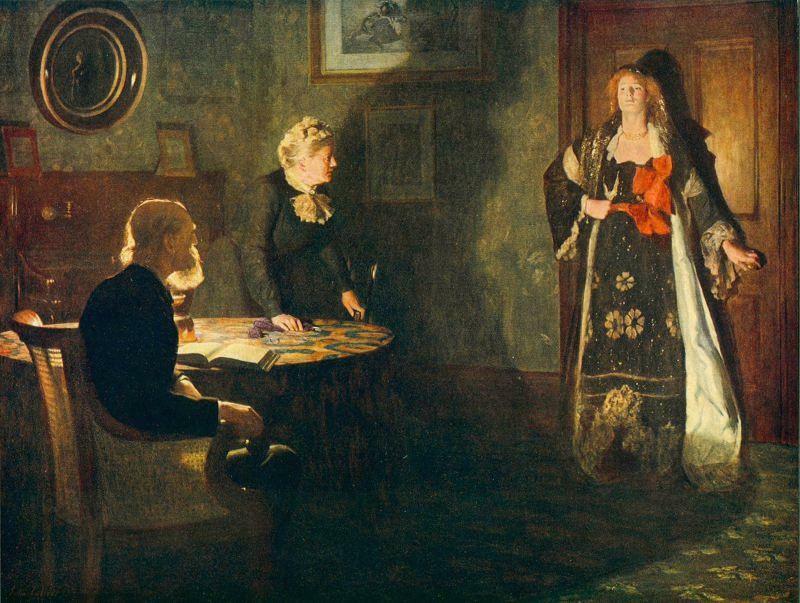 In contrast with Orchardson’s early more obvious treatment of the problem of marriages of convenience (which were often also arranged marriages), Collier poses a real problem. The mother, dressed in the black implicit of widowhood, stands haughty, her right arm resting on the mantlepiece. Her daughter cowers on the floor, her arms and head resting on a settee, in obvious distress. Perhaps the daughter has been (or is to be) married into money to bring financial security to the family, now that the father is dead? Collier himself offered a slightly simpler version of that, when finally tackled by the press, which omitted reference to the father’s death. 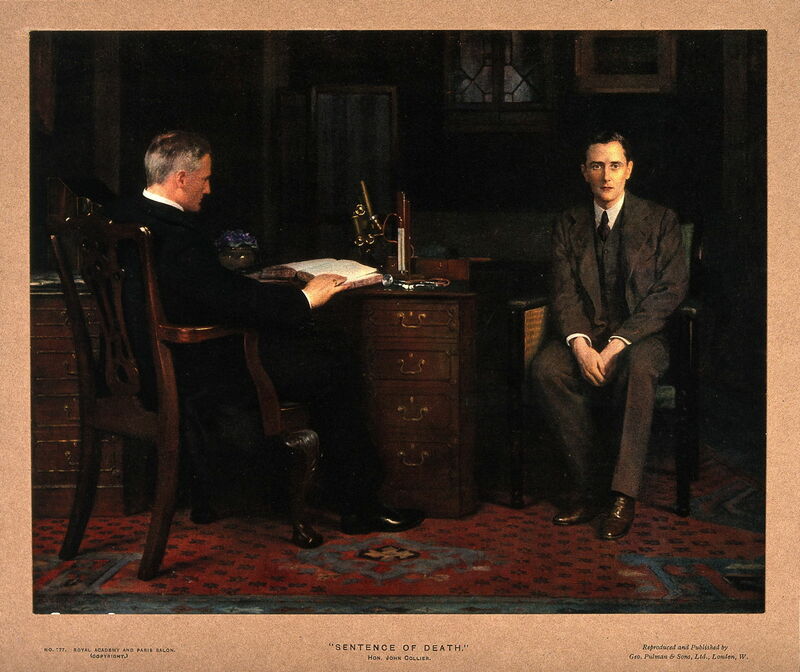 By the time that Collier showed his next problem picture, The Sentence of Death (1908), they had become established as a familiar feature of the annual Royal Academy exhibition. This painting at first disappointed the critics, but quickly became very popular. Sadly the original work has not lasted well, and I rely on a reproduction made at the time. At a time when disease and death were prominent in everyday life, this painting might seem quite ordinary. A young middle-aged man stares blankly at the viewer, having just been told by his doctor that he is dying. The doctor appears disengaged, and is reading from a book, looking only generally in the direction of his doomed patient. Unusually for Collier’s problem pictures, and for paintings showing medical matters in general, the patient is male. This led to speculation as to the expected male response to such news, and questions as to what condition might be bringing about his death. There was even debate about interpretations of the doctor-patient relationship. John Collier (1850–1934), Sacred and Profane Love (1919), oil on canvas, 104 x 142 cm, Northampton Museum & Art Gallery, Northampton, England. The Athenaeum. The First World War changed Britain, and British art, dramatically. One of Collier’s last problem pictures was Sacred and Profane Love (1919), which drew attention to women’s problems again. On the left, sacred love is shown in a modestly if not dowdily dressed plain young woman, and on the right, profane love as a ‘flapper’ with bright, low-cut dress revealing her ankles, flourishing a feather in her left hand. The suitor is shown reflected in the mirror above, a smart young army officer. Although not as enigmatic as his earlier works, Collier remained very topical, achieving his narrative using dress and composition, rather than facial expression. The remaining problem paintings by Collier are an even greater problem in that I have been unable to find any further details of them, or of the artist’s intended narratives. John Collier (1850–1934), The Laboratory (1895), other details not known. WikiArt. 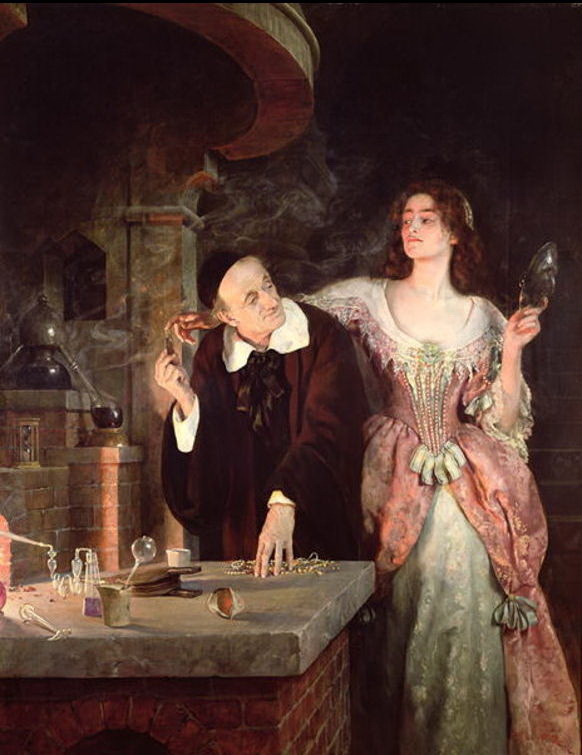 In The Laboratory (1895), there is clearly a narrative between the old alchemist and a young woman, who is trying to take an object from the man’s right hand. This may be a reference to a text narrative which Collier was exploring prior to his real problem pictures. John Collier (1850–1934), The Sinner (1904), oil on canvas, 147.3 x 108 cm, Victoria Art Gallery, England. The Athenaeum. 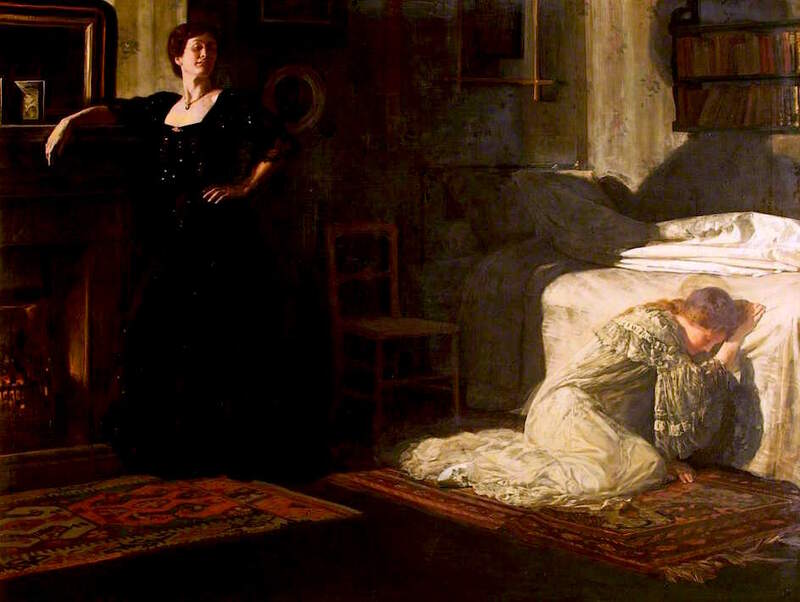 The Sinner (1904) is most probably another problem picture, as it shows a woman, possibly dressed in widow’s weeds, making an emotionally-charged confession. This begs much further speculation. John Collier (1850–1934), Fire (date not known), oil on canvas, 140.7 x 120.3 cm, Leamington Spa Art Gallery & Museum, Royal Leamington Spa, England. WikiArt. 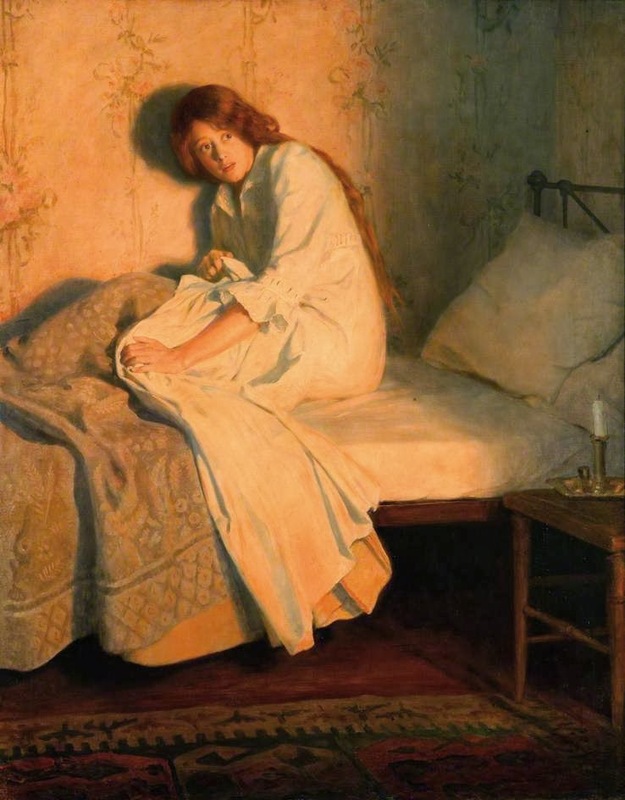 Fire (date not known) shows a young woman, sat up in bed, afraid by the bright warm light of a fire, presumably one which is in the same building and putting her into danger. It is not clear why she is not doing anything to try to escape, though. John Collier (1850–1934), The Minx (date not known), oil on canvas, 75 x 62.3 cm, Swindon Museum & Art Gallery, Swindon, England. WikiArt. The Minx (date not known) shows a femme fatale holding what might be a mirror in front of her. Unfortunately the condition of the painting is not good, and its narrative now more obscured that it was. This unusual and short-lived sub-genre exploited the ambiguities that arise in narrative paintings to elicit debate and speculation. As Fletcher points out, its themes were the problems of the day, particularly those of women, their roles, and sexuality. Although other good narrative painters have achieved similar depth in their works, Collier seems to have been unique in his development of such problem pictures. Fletcher PM (2003) Narrating Modernity, the British Problem Picture 1895-1914, Ashgate. ISBN 978 0 754 63568 0. Posted in General, Painting and tagged Collier, Hunt, narrative, Orchardson, painting, Yeames. Bookmark the permalink. A lovely piece – thank you for drawing attention to it. If you can locate a copy of the reference given here, you will find a lot of additional material on Collier and the ‘problems’ with which he wrestled. It is sad that he is now so neglected. Many thanks for your reply, and for pointing out ‘Narrating Modernity’, which I’ve not come across – I’ll look out for it. Do you think that the woman in ‘The Sinner’ might be wearing widow’s weeds? If so, that puts an entirely different interpretation on the picture to mine. Incidentally,’The Laboratory’ (which I’ve not seen, or at least not noticed before) is an illustration of Browning’s poem of the same name. The woman (who calls herself a ‘minion’, which I take to mean small in this context – Collier hasn’t made her look small, however) is buying poison with which to murder her rival in love. It’s a terrifically over the top, grand guignol poem. Thank you, David. I had not noticed that reference in ‘The Laboratory’, and am very grateful for your pointing it out. The trouble with deciding whether or not a Victorian woman was in mourning is that so many wore mourning clothes in company with Queen Victoria – so I think that those are, but whether she is in personal mourning is much less certain!